Following on from my earlier post The Living Room, which is the practical tale of our lounge so far, I thought I’d traumatise myself by showing you guys the inspiration behind my choices so far, the eventual ‘look’ I would like to create in this room and the things I would like to buy to get us there, should money be no object! In general, I would probably class my aesthetic as ‘Scandi’ which in my eyes means light, airy spaces, with texture and an eclectic mix of wood furniture and industrial finishing touches. Although I’m not a huge fan of turquoise, I really like this cosy period living room, which is quite similar in size and layout to ours. These guys were lucky enough that their original floorboards were in good nick, but I’m relatively happy with our laminate compromise! 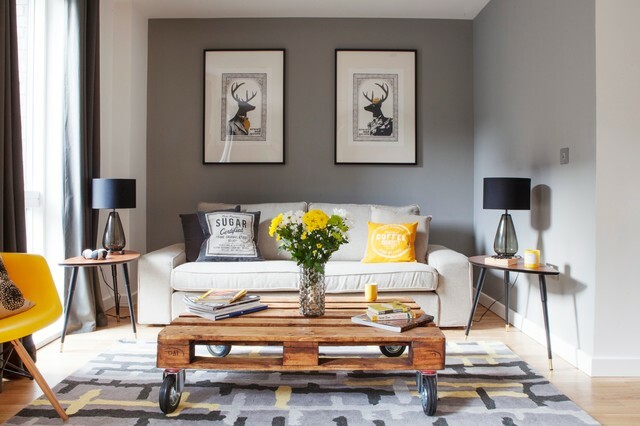 Clearly, I love the accents of yellow in this grey scheme, but I also like the touches of black, the mid-century furniture and wood floor/ white skirtings / grey walls combo. Clearly my living room is nowhere near the same kind of scale as this, I love the mix of textures, tones of grey and patterns. I also really like this modern square sofa style. 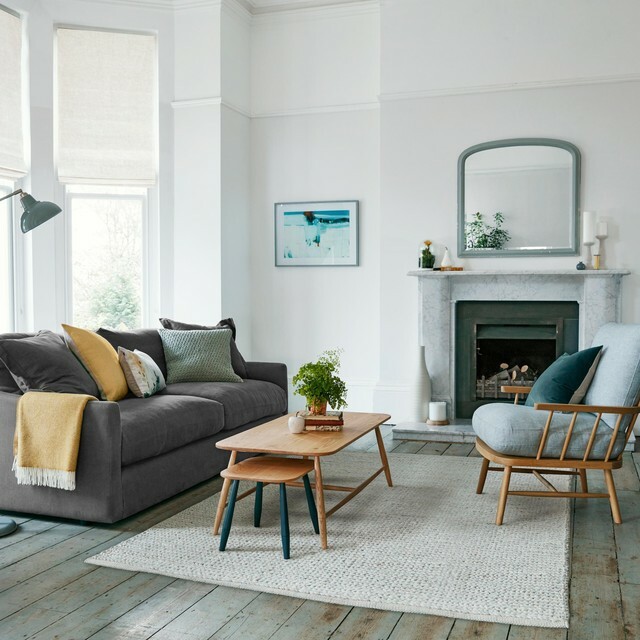 I adore this armchair – the turned wood legs and arms and squidgy looking cushions – and it was this that really caught my eye (something which I’ve tried to replicate on a tiny budget with my Gumtree chair!) I just really like everything – it’s light and airy, slightly coastal, with a hint of tradition with the fireplace. I really want blue sofas if/when we decide to go the full monty and purchase some proper furniture! I love this colour and how it sits in an otherwise pale and simple scheme. So, a fairly similar aesthetic throughout these images, with a mix of modern and mid-century furniture, the fireplace and bay window being the focal points, a mix of grey neutrals, made slightly more industrial looking with a few black elements, and spruced up with blue and yellow accents. Simple! Nottingham parquet top coffee table, £249, La Redoute. So, it’s not likely to happen soon, but I hope this shows you what I am trying to move the room towards! Do you like my plans? Any suggestions? 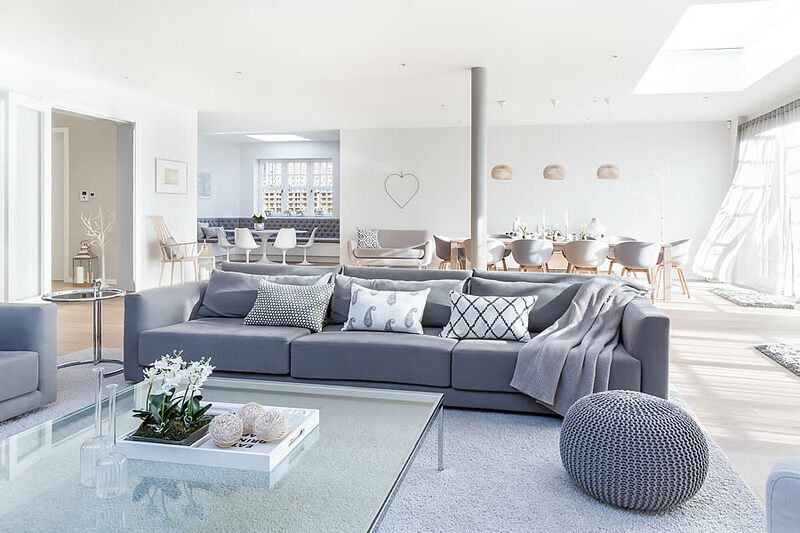 This entry was posted in Inspiration, Our House and tagged blue, dream home, grey, home decor, home renovations, home style, industrial, Inspiration, interior design, interior trends, interiors, living room, mid century, scandi, white. Bookmark the permalink.